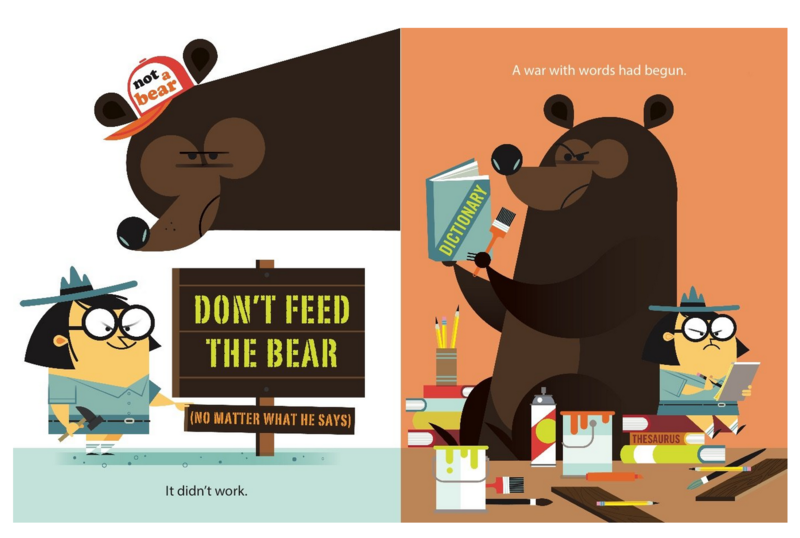 Home Uncategorized Don’t Feed the Bear + a giveaway! When I learned that loyal PBB subscriber Kathy Doherty had her debut picture book coming out this spring, TODAY, as a matter of fact, I requested a review copy. Oh, what a fun read aloud it turned out to be! Kathy agreed to let me share it with all of you and even dropped by to answer a few questions. Bear had a perfectly great life … until Park Ranger put up a sign that read DON’T FEED THE BEAR. Well, Bear isn’t about to let Park Ranger get away with claiming all the picnickers’ goodies for herself. Crafty Bear puts up a sign of his own, and the battle for yummy grub in on! Each worthy (and hungry) competitor tries to persuade parkgoers to their side. At stake: delicious chow, like juicy burgers and chewy cookies. Who will win this war of words? The book is a bit oversized, which is perfect for group sharing. And the text throughout is minimal, leaving plenty of room for illustrator Wass to let ‘er rip. And he did! Text and art blend seamlessly to create a goofy, irresistible story of rivals who come to realize that joining forces will benefit them both. Okay, now I can talk about the read aloud factor. Kathy knows what appeals to kids: Short, punchy sentences a reader can read slowly to pack with emotional emphasis — and enough onomatopeia to have kiddos running around for days going “Smackity, smack, WHOMP!” and “Stompity, stomp, grrrr!” I love that Kathy doesn’t hit readers over the head with her point, either, but SHOWS kids the meaning of If you can’t beat ’em, join ’em! Thanks, Kathy, for agreeing to answer a few questions. JE: Both character are equally strong. Both have their own, equally self-serving agendas. How did you decide Bear was to be the main character? KD: Right from the beginning, I knew this had to be Bear’s story. After seeing a DON’T FEED THE BEAR sign, I started to think what if. What if a bear had a perfectly wonderful life until a park ranger put up a DON’T FEED THE BEAR sign? What if the bear then saw the campers feeding the ranger, and decided to retaliate by putting up his own sign? What if I could create a funny sign war between these two characters? JE: Was it difficult deciding how these two were going to resolve their issue? KD: Not too difficult. I wanted Bear and the ranger to eventually call a truce. And I wanted the campers to provide food that would give Bear and the ranger the idea to work together and have a picnic. I tried a few scenarios and finally settled on the least wordy, drawn-out solution. JE: Other writers are always curious about illustration notes. Did you include notes for each of the book’s funny signs, or were those left to illustrator Chip Wass? KD: I didn’t add art notes, but I centered the signs and color-coded the words. Chip Wass, the illustrator, added even more silliness to the signs. He’s an award-winning artist who designs characters and illustrations for Disney, Cartoon Network, The New York Times, ESPN, and Wendy’s. JE: His experience shows! Can you tell us about your experiences as a first-time author … submissions, expectations vs. reality, your road to publication, etc? KD: I got an agent way before my work was ready to submit. Then my agent let a few authors go in 2014, including me. She hadn’t sold anything of mine, but she said I could still send her stories until I found a new agent. Not long after we parted, I sent my ex-agent two manuscripts. After doing two revisions for a Peachtree editor, she sold that manuscript in 2015. The other manuscript I showed her was DON’T FEED THE BEAR. She said it was cute, but she didn’t think it would sell. As luck would have it, I submitted DON’T FEED THE BEAR in 2015 to a Sterling editor. Two months later, he sent an email saying he loved DON’T FEED THE BEAR and asked if he could send a term sheet. I had no clue what that meant. So I emailed my author friend, Candace Fleming, and she said, “YOU SOLD A BOOK!” I was surprised the Sterling editor had not asked for a revision. Since I wasn’t under contract with my ex-agent, I hired a literary property lawyer to negotiate the Sterling contract. After that, my ex-agent semi-retired, and we amicably split for a second time. I’m the only author in the world who has had an ex-ex-agent! JE: Proving once again that a rejection is only ONE person’s opinion! What’s next for you? JE: Fingers crossed for you, Kathy! 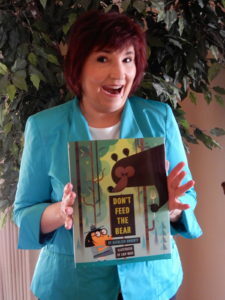 KD: Thanks, Jill, for featuring DON’T FEED THE BEAR! 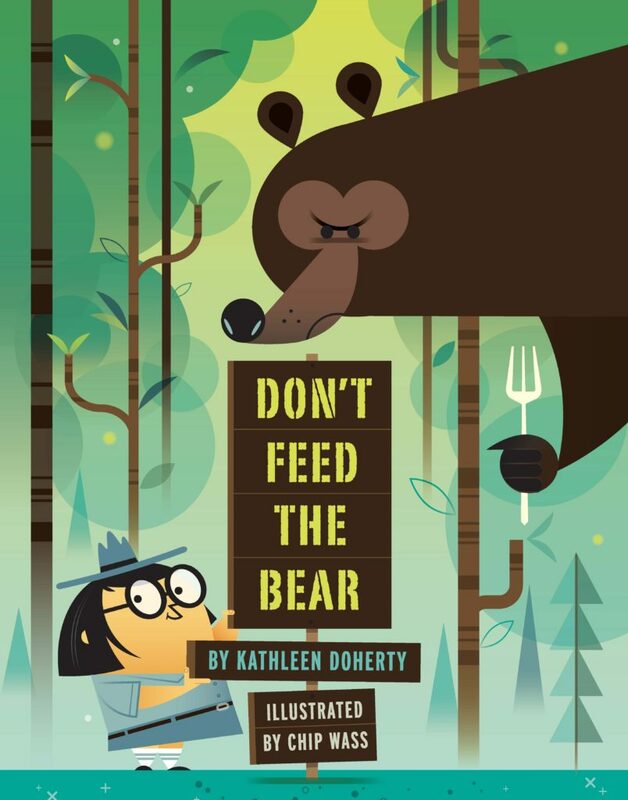 Readers, Kathy’s publisher, Sterling Children’s Books, has offered to send one winner their very own copy of DON’T FEED THE BEAR. All you have to do is leave a comment below between now and April 20th. I’ll announce the winner in my next post. Chip Wass, Don't Feed the Bear, humor, Kathy Doherty, Sterling Children's. Bookmark. Thanks, Tammi! Sterling has great taste publishing both of our bear books this month! Sounds like a winner for sure! This looks so fun! Congratulations! What a wonderful book! Congratulations, Kathy! Looks like a fun one my son will enjoy. He loves bear books! Oh my goodness, this looks hilarious and adorable! Congratulations on your success. I can’t wait to read this one! I appreciate the kind words. Thanks, Elizabeth! Fun story and the childhood memories of Yogi and BooBoo! Also interesting to hear about Kathy’s publishing journey! What a fun story and the perfect illustrations! Can’t wait to read this one! What an amazing story and journey for this book. I can’t wait to read it! Yes, Lisa . . . it’s hard to believe! Thanks for commenting. I’m excited for this one. Thanks for the great interview! I’m so happy for you, Kathy, and I know this book will make kids (and bears) happy too! Oh, Deb, what a journey. Thanks for your kind words. This looks like a very fun read! Your book looks incredibly cute. Can’t wait to read it! I appreciate your kind words, Linda. Thank you! What a fun story! So great to hear your journey to publication! Congratulations! This looks hilarious . . . can’t wait to read it! Congratulations, Kathy!! What a fascination story. This is definitely a different route to publication. I’m so glad you made it. This book looks wonderful. It was quite the journey, David. Thanks for your kind words. Can not wait to read this—aloud! It’s been a unique journey. Thanks, Karen! I love the idea of a sign war between the bear and the ranger. What a hoot! 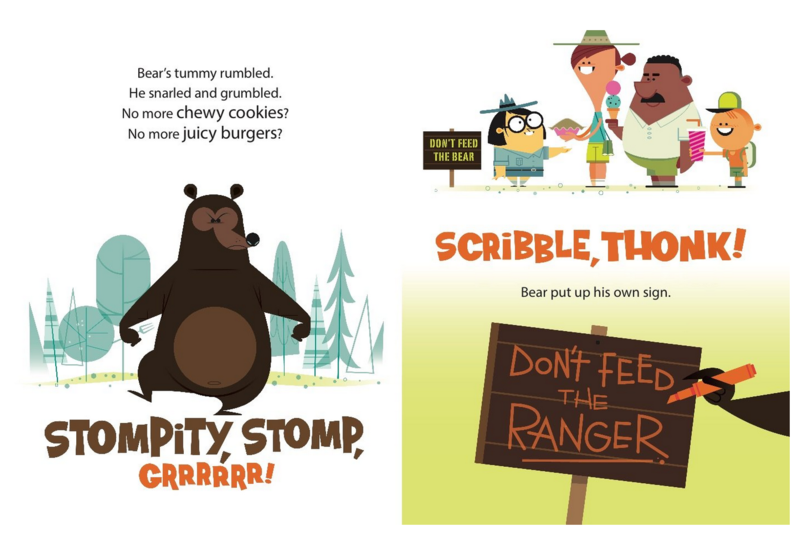 Love the illos and the fun interplay between ranger and bear! A winner for sure. I hope you’re right, Cathy. Thanks! This looks FABULOUS – ad what a great publication story 🙂 Thanks so much for sharing! Kathy, I’m laughing at your ability to sell more books through your “ex-ex-agent” than your agent. I’m curious how you pitched DON’T FEED THE BEAR. Did you compare it to Yogi? Manju, no I didn’t compare it to Yogi Bear. I let the manuscipt stand on its own. Thanks for your comment. Congratulations! This book looks wonderful and I need a copy! Cannot wait to read it! What incredible circumstances. That really inspires me to keep the dream alive and realizing there is a specific editor waiting to see my book! Congratulations! Yes, Jerry, never give up. I have more perseverance than talent. Keep writing and revising! This sounds wonderfully funny! Congratulations, Kathy and Chip! This sounds like such a FUN book! Can’t wait to read it. Congrats on all your successes! Kathy, I appreciate your kind words. Thank you! . . . And I miss those Chautauqua workshops. Thanks for sharing Kathy’s book and story, Jill. Congrats, Kathy. This looks like the perfect picnic picture book! This book looks hilarious. 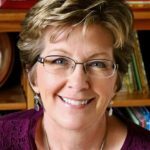 Thank you for sharing your journey to publication story – fascinating! Yes, Heather, it’s been quite a unique journey. Thanks for your comment! This book does look like it will make readers laugh and cheer on either the bear or the ranger, maybe both! 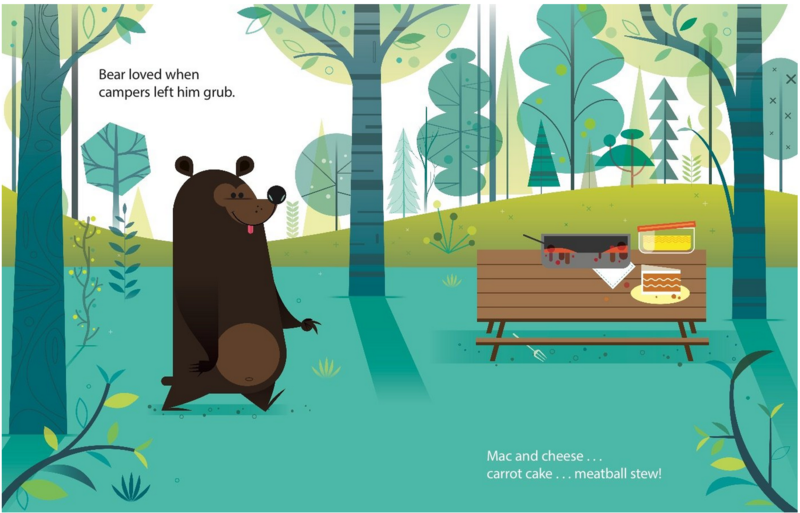 thanks for the post today–I love Yogi and Boo Boo and those picnic baskets! Congratulations! I look forward to reading this book! Love the story! Yours and Bear’s! So glad they both had a happy ending. 🙂 Congratulations on your success and wishing you tons more! I appreciate your kind words. Thanks, Danielle! sounds like a great smooth read! Love a good war with words. Congrats on your debut release, Kathleen! Congratulations, Kathy! So glad to see your story as a book!! How cool is that?! I love the illustrations! So happy for you!! Hi, critique partner! Thanks for the congratulations! Wow, this looks adorable! On my list!!! Congratulations on your success! The story about a “sign war” between two appealing characters sounds like a fun read! Can’t wait to read it ! Thanks for your kind words, Valerie! Kathy, this book sounds adorable. I can’t wait to read it! I can NOT wait to get my hands on this book!! I love a great read-aloud. 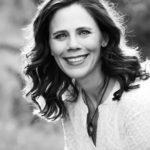 Thank you for sharing your agent story, it gives me hope! Aw . . . thanks so much, Julie! Thanks for your comment, Beth! I’ve got to get this to read at storytime! It looks so fun! I appreciate that, Felicia! Thanks! You just have to love the “not a bear cap”! Ha! I do! Thanks, Cindy. This book is going to be so much fun to read. Can’t wait! Congrats! This looks absolutely adorable…can’t wait to check it out! Thanks for another great interview–this book looks really fun–can’t wait to see it, art and text both! I love your inspiration for this story! Can’t wait to read the book! Congratulations!!! I’m adding this to my TBR pile right now! Looks adorable! I appreciate that! Thanks, Tracy. Your own story and that of Bear’s are terrific. Thanks to both you and the illustrator. Thanks, Dorothy. Yes, it’s been quite a unique journey. DON’T FEED THE BEAR sounds absolutely delightful! Such a great example about how subjective this business is, and a powerful message to not give up! Absolutely never give up! I’m proof of that! Thanks, Rebecca. I would love to add this book to my school’s library media center collection. What a fun idea, and those illustrations are so great! Congrats Kathy! Can’t wait to see more from you! Thanks, Kathy, for adding to the wealth of fun pbs for children! Can’t wait to read the interplay between the two characters. Thanks. Congratulations Kathy! Your book sounds and looks wonderful. Being part of a family who camps in the Adirondacks, this will be a must for gifting. I appreciate the kind words, Mary. Thank you! Oh, Kathy! This book looks hilarious! What a fun premise! I can’t wait to read it! Becky, thanks for your kind words. This book seems packed with humor. Definitely on my list to read! I love the illustrations, too! Oh, dear Kathy! I’m SO happy for your success!! Well-deserved! I can’t wait to hold your book in my hands!! Congratulations!! Thank you, Girlfriend! When are we doin’ lunch? what a great story idea! This book looks so cute! Thank you for sharing this post. I loved learning more about the behind the book. This was a fun interview. Thank you! It’s been such a unique journey, Ashley. Thank you! This book looks like so much fun! I can’t wait to read it! After a recent trip to Yosemite, the book seems timely! Love the illustrations. I love reading picture books that are great read alouds. They hook kids into stories and reading. I cannot wait to read this. Thanks for the kind words, Cassie! I love the premise of this book! I love the humor and the fun illustrations! Can’t wait to get a copy! OMG — I just cannot WAIT to feed my literary appetite with this book! Best of lunch to you, Kathy! This makes me smile. Thanks, Lynne! I can’t wait to read this book. My favorite animal is a bear. So this looks like a must read to me. Thank you for sharing such a fantastic interview with us. Love this! I think this might make a great Readers’ Theater title. Sounds like a great story and I love the artwork! This looks unbearably adorable. I’ll make sure to put in a purchase request at my local libraries. Thanks for the kind words, Shannon! I’m so happy this is out! Can’t wait to see the final book! Hi, Critique Partner! Thanks for the kind words! Thanks, Lisa! I’ll see you at the retirement party. I’m late to the party, but congratulations, Kathy. I love a good battle of wits and look forward to seeing how this one plays out.